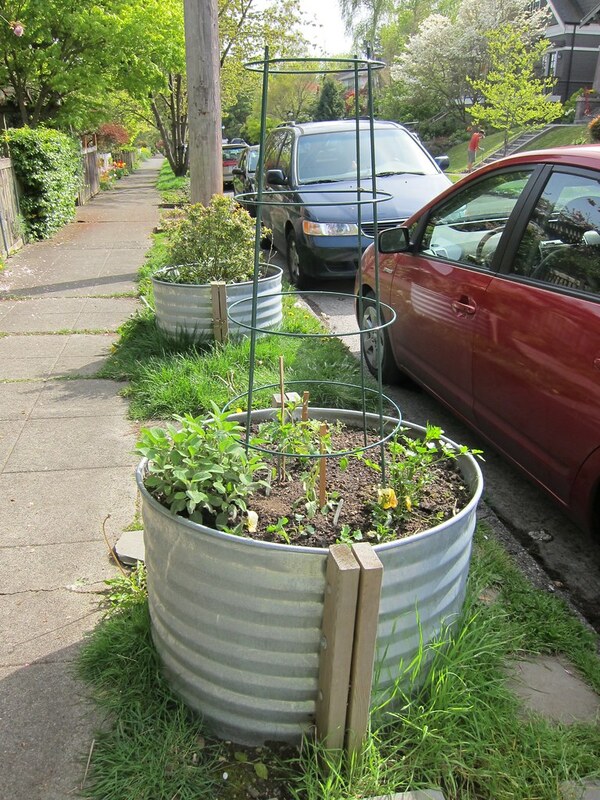 Not everyone would think to put a galvanized planter in their parking strip. It might be too easy for someone to dump the dirt out and walk off with, right? See how they are cleverly bolted to 2 X 4s that are sunk into the ground? These babies aren’t going anywhere! 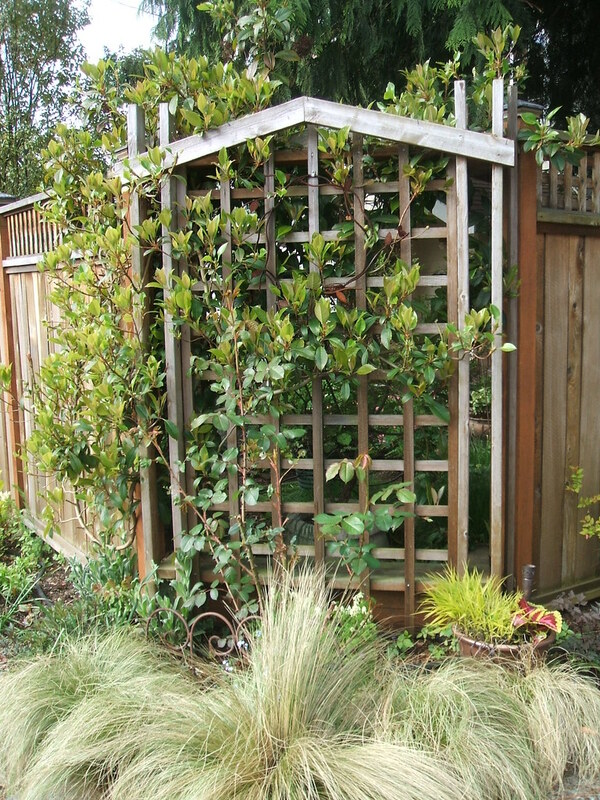 And an inexpensive trellis makes the vertical space usable. Wonder what will be on this one come summer? 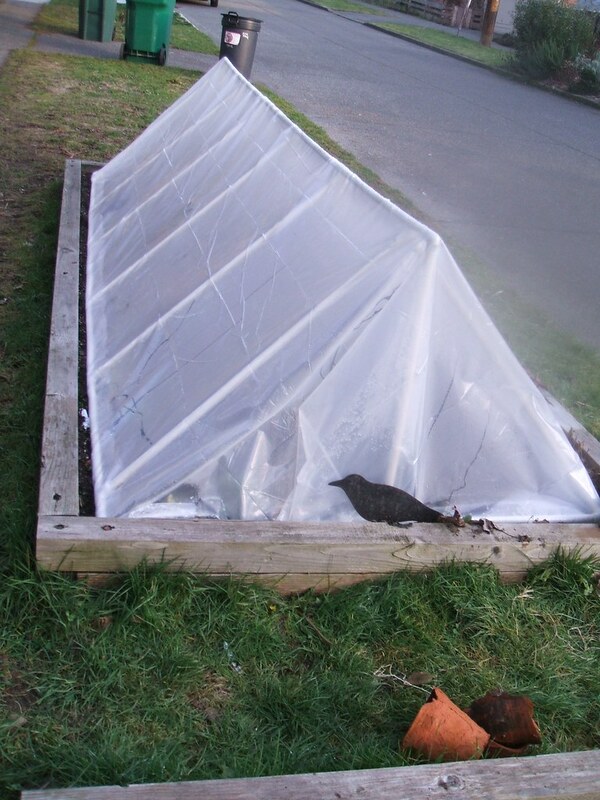 The uncharacteristically deep and long freeze Seattle endured in December subjected winter veggie gardens to a real beating. 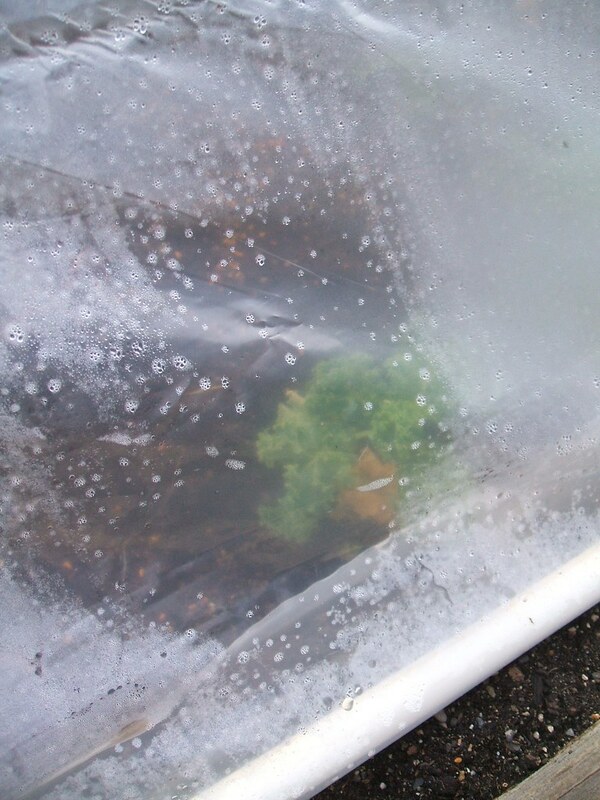 Many unprotected plants, including some that were hurriedly swaddled in floating row cover, did not survive. 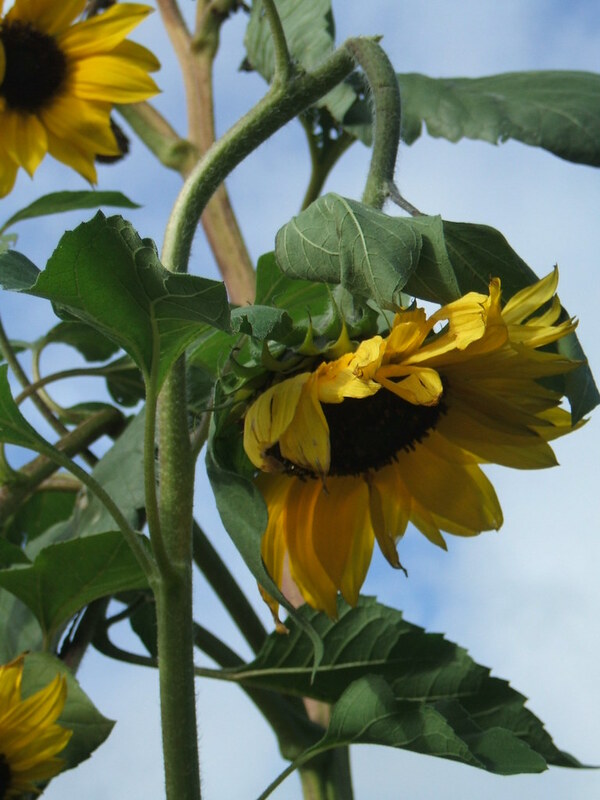 Even some carefully shielded by a pro gardener under the warming embrace of a hoop house just couldn’t hack it after days in the 20sF or lower. 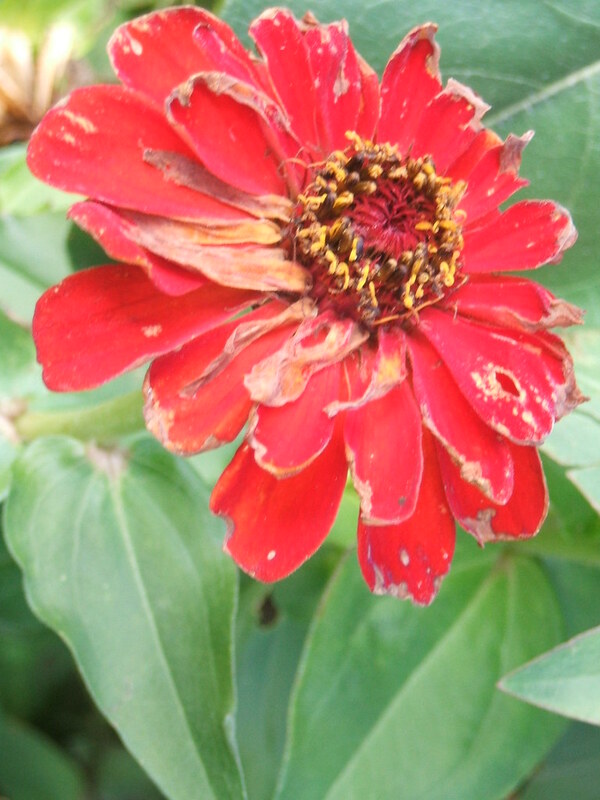 This was one mean frost! 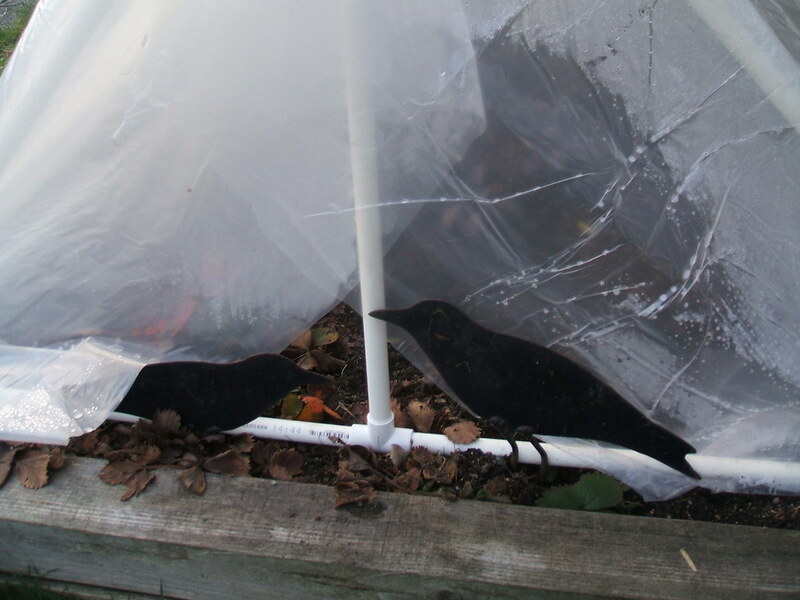 That’s why, when I saw this plastic tent-like structure in a parking strip recently, I wondered if its contents had made it through okay. 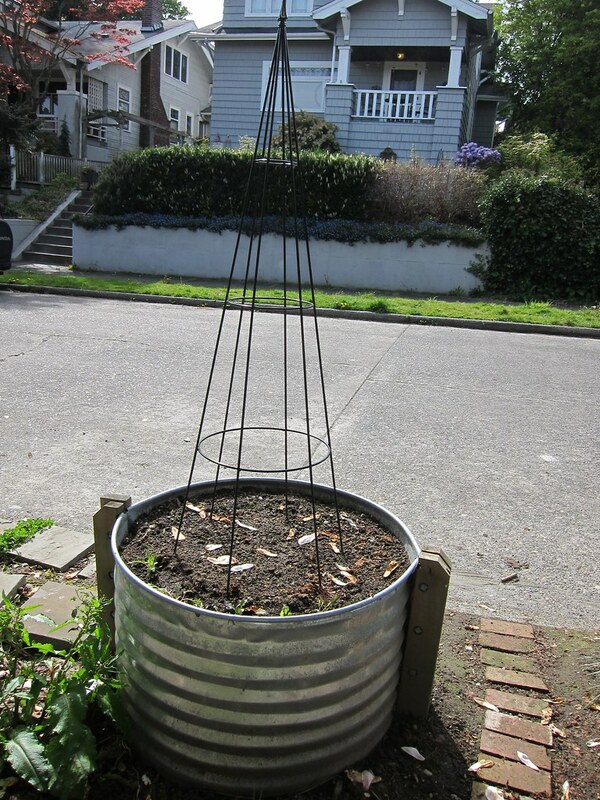 Are the crows just decorative or do they deter potential pilferers? I took them as a warning and didn’t poke my camera inside for a closer look. Later, some real corvids were spotted on a house’s rooftop. 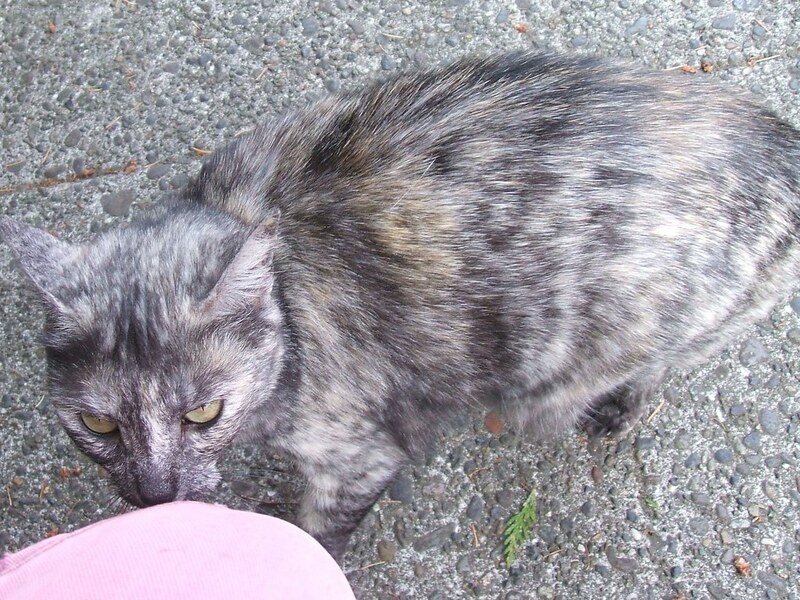 They like to look in rain gutters for tasty tidbits. 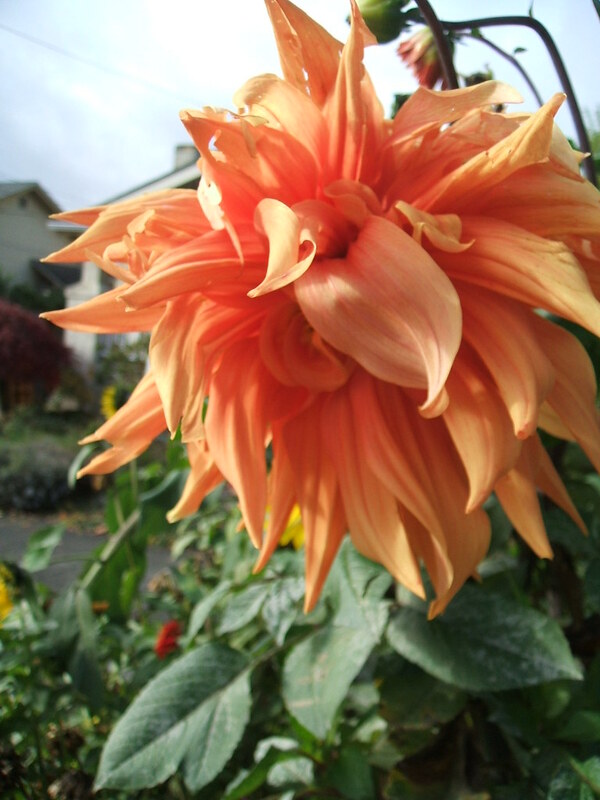 This is one for the flower-lovers (you know who you are, and aren’t). 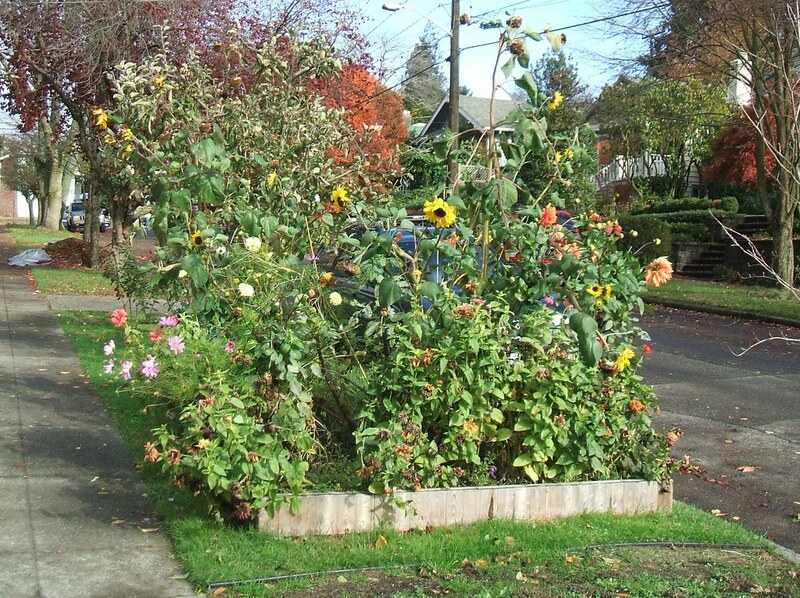 A year or so ago, a simple raised bed appeared in the parking strip a few blocks from my house. Good soil went in, things were planted, I didn’t go past for a while, but when I was out for a walk the other day, we’re talking almost-mid-November here, I almost fell over when I saw this. What are they feeding those things? The good stuff, obviously. 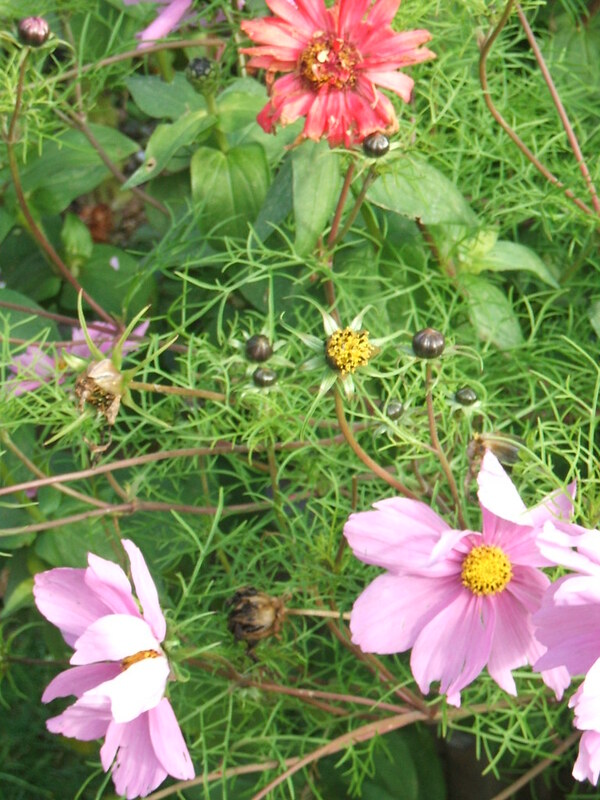 My cosmos are long gone, at least I think they are – maybe I should look again! These ones are not only still blooming, they are forming new buds even as the evening temps dip toward freezing. 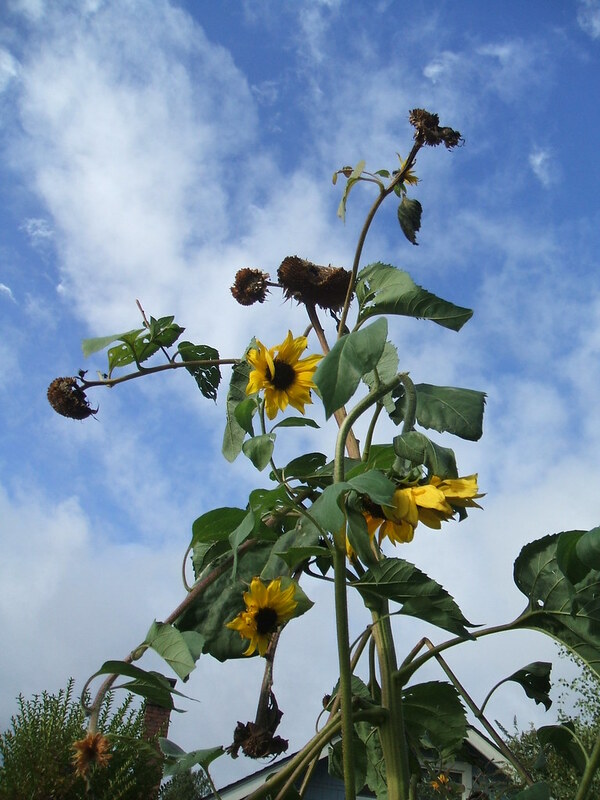 My sunflowers are long gone too, and yet here are these, still standing proud and topping out at probably 11 ft. How they survived the previous night’s wind storm, I have no idea. 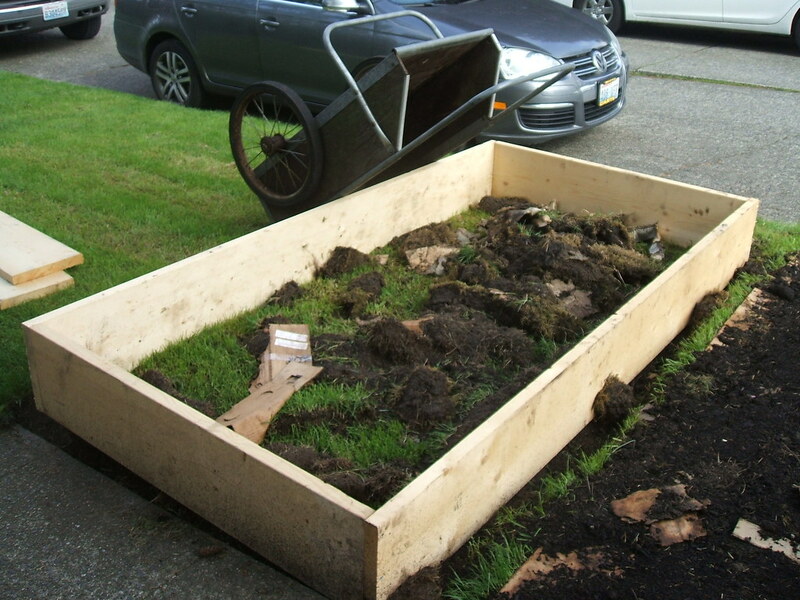 This gardener chose not to rip up the entire parking strip, just a small patch of sod for the raised bed. 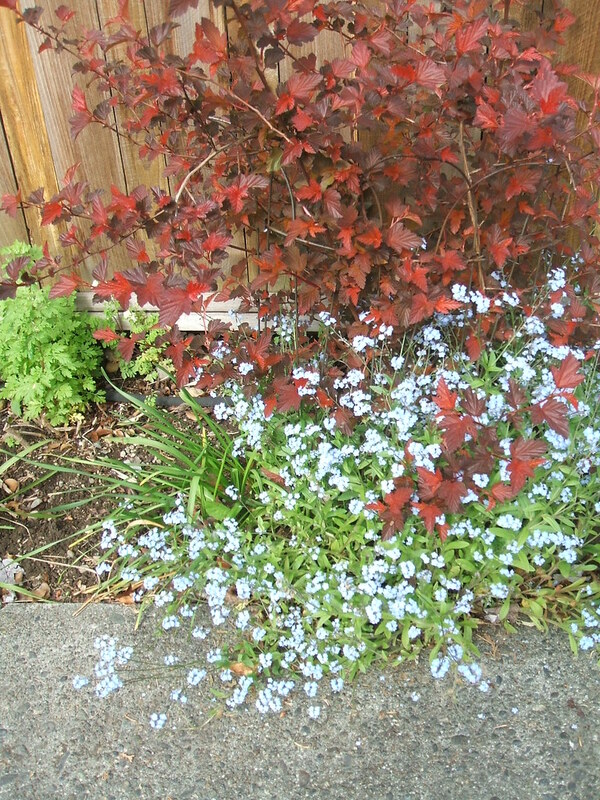 But man, you can fit a lot of loveliness in a small space if you get it right. I can’t wait to see what they get up to next year! 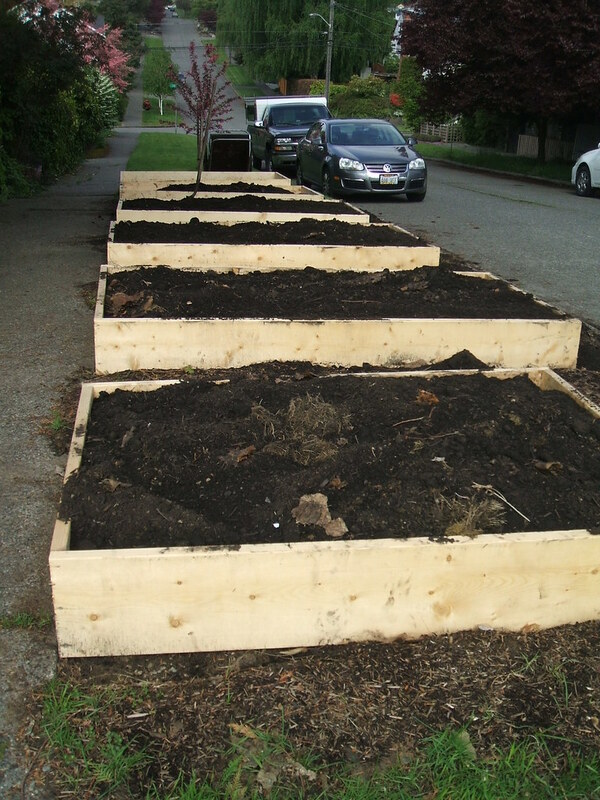 A few months ago, I wrote a post about a row of raised beds that had suddenly appeared in the parking strip of a house on our route to school. 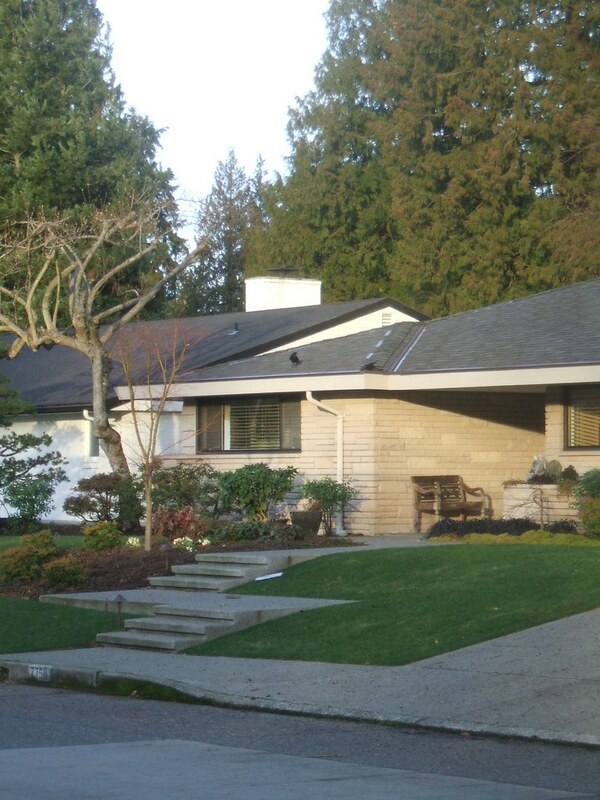 If you have a spare second, click here to see the “before” photos. The other day, I was back by that way and almost crashed the car when I saw the transformation that had taken place. 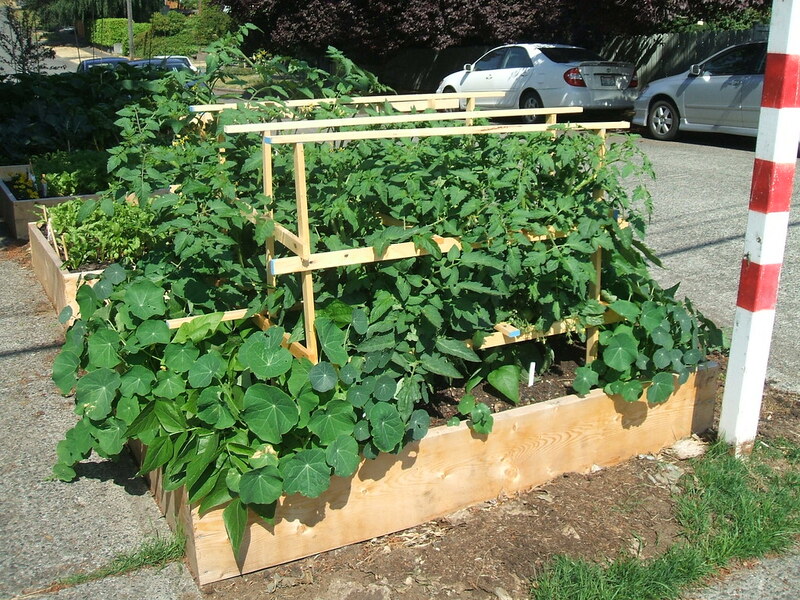 I guess the question of whether raised beds with good soil assist in the growing of delicious veggies in a tough spot has now been definitively answered. Check it out! 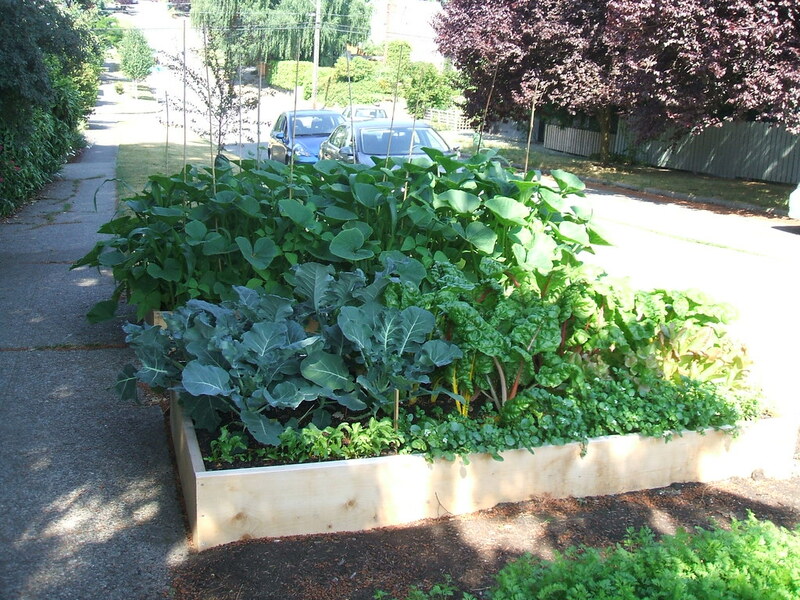 One bed left, maybe for fall veggies? 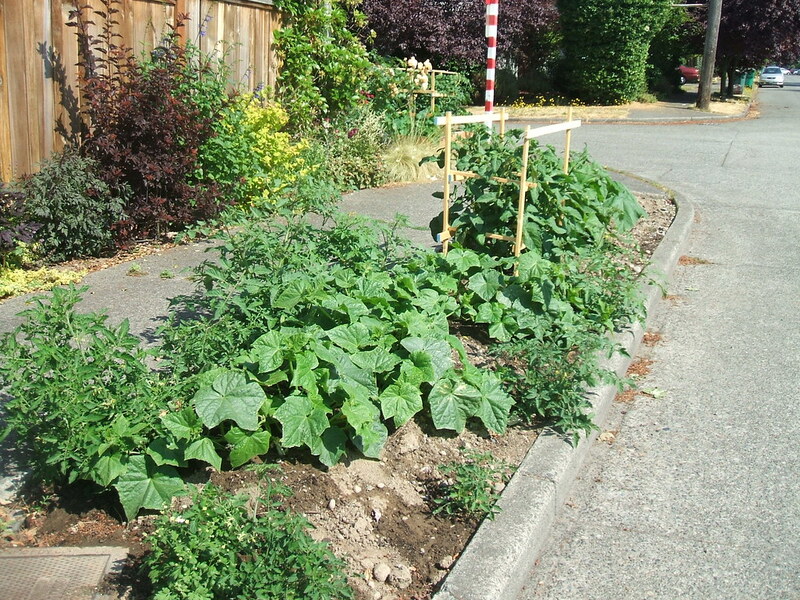 The Seattle Times had this article on the front page of its online edition today, discussing the newly relaxed rules for growing veggies in our city’s parking strips. The revolution is underway! We’ve been spending a lot of time at the nearest school playground this summer, since my daughter wants to keep her monkey-bars skills on the upswing. I hadn’t looked at the school garden in a while, but last week I peeked over the fence and saw what they’ve been growing. 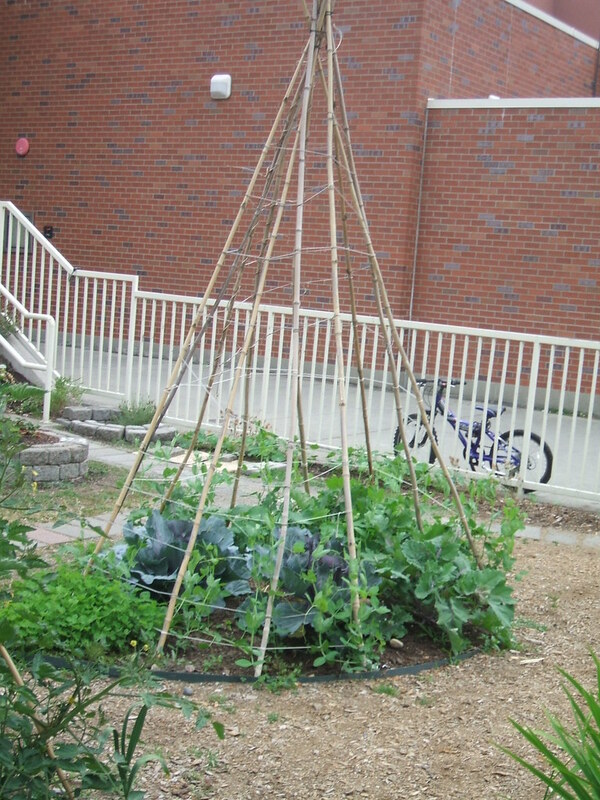 This giant teepee looks like it was pretty easy/cheap to make, just super long bamboo stakes and some twine, plus some plastic edging material to outline the circle, keep the stakes seated, and hold the good soil and maybe even a little water in. 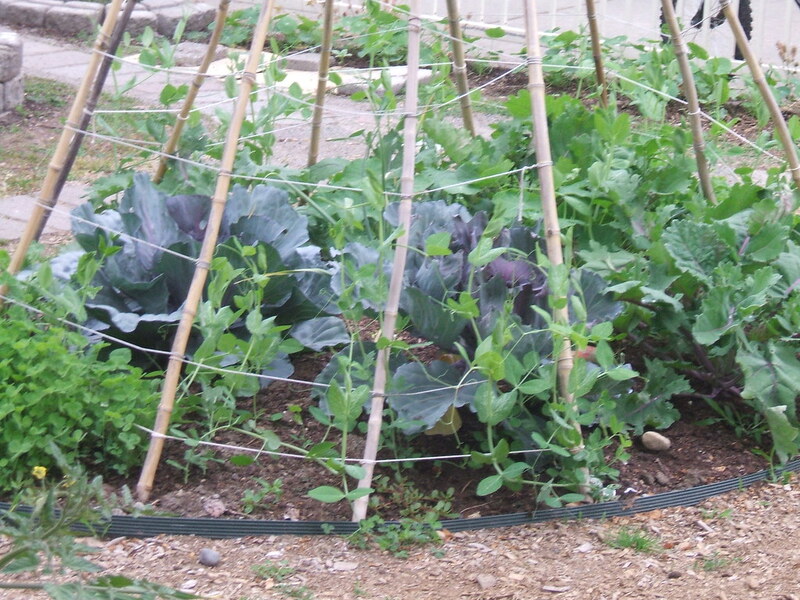 Peas are beginning to wind up the stakes, while beautiful purplish cabbage and broccoli expand to fill the interior. 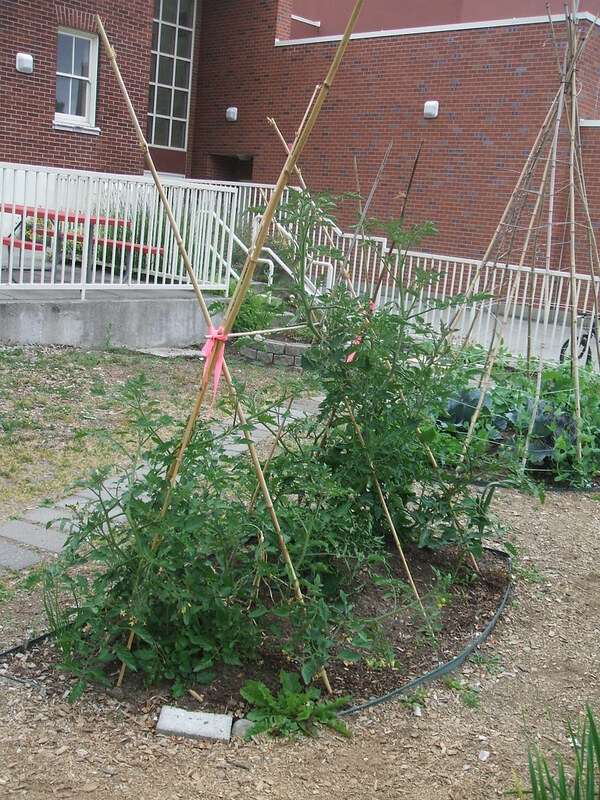 Nearby, another bamboo structure, this time an A-frame trellis for tomatoes. I’m more used to seeing tomatoes in cages or trained against fences, so this open structure is a little different. I wonder if it will do the trick of keeping them from falling over? I guess it depends on how tall the tomato varieties are. 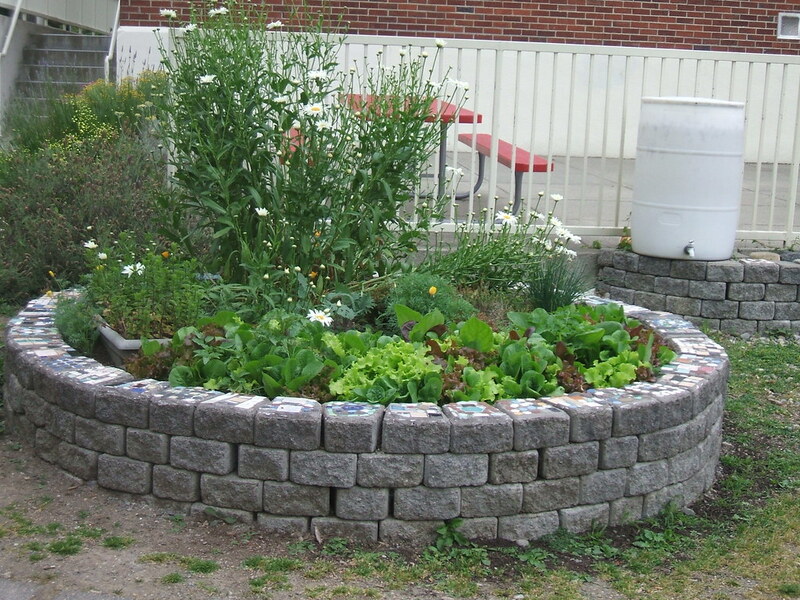 I’ve shown this concrete-block raised bed before, since it seems pretty easy to build and has the nice touch of a mosaic top. 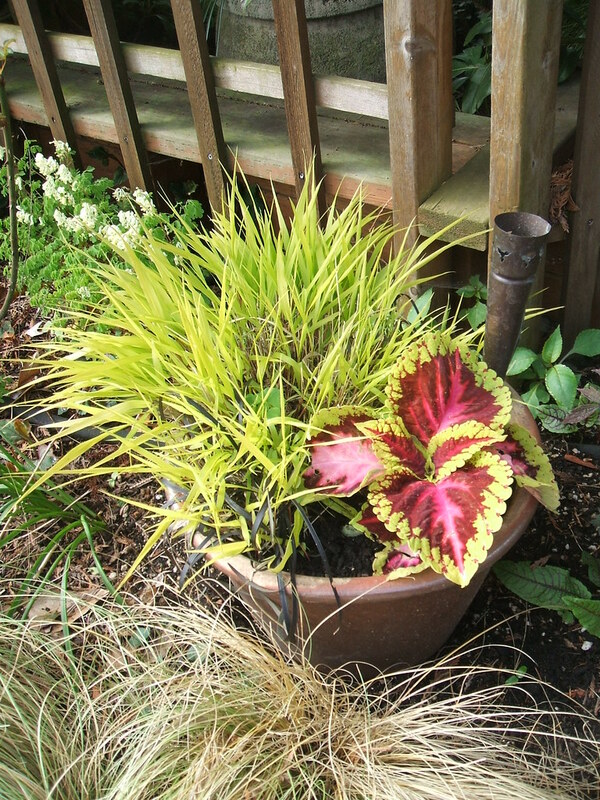 This summer, it contains many varieties of lettuce, so lovely in their contrasting colors, a pot of mint, and many many daisies. 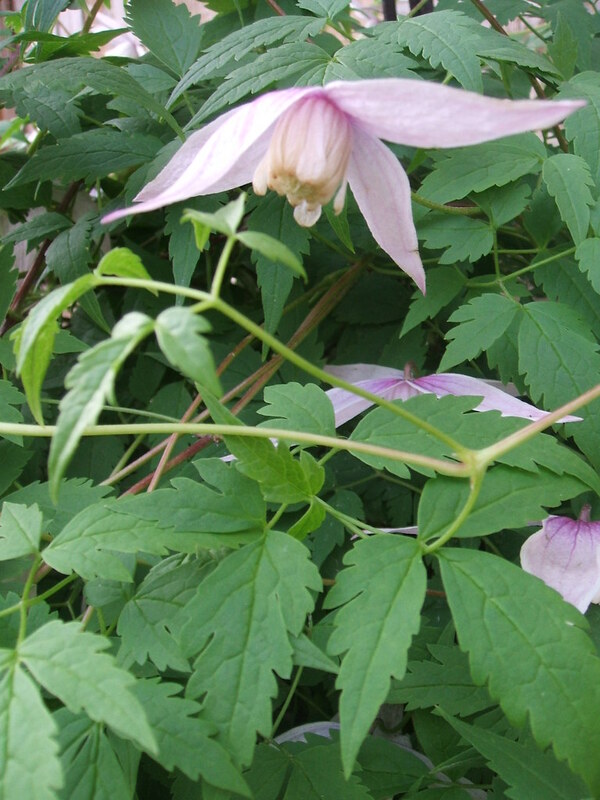 Those last may have crept in there as self-seeders, they do that in my garden at least. The big white barrel looks to be a rain collector – so they are teaching conservation and sustainability too, nice to see. I’m kind of curious to see what happens at harvest time – do the kids at the summer programs eat salads and broccoli, or is it all just educational/ornamental? 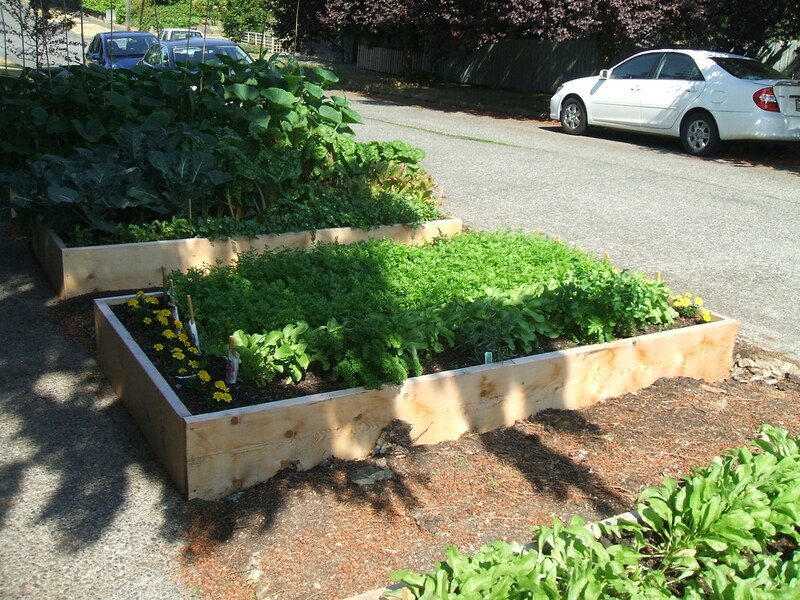 I dream of having the time/energy/wherewithal to write a successful grant for our own school to become an Edible Schoolyard. We have the space, but I don’t know how much longer we’ll be in it since the district wants to shift things around in our part of Seattle – it’s hard to think of starting something like that and then having to leave it behind. Alice Waters started this program in 1995 at a public school in Berkeley, CA. 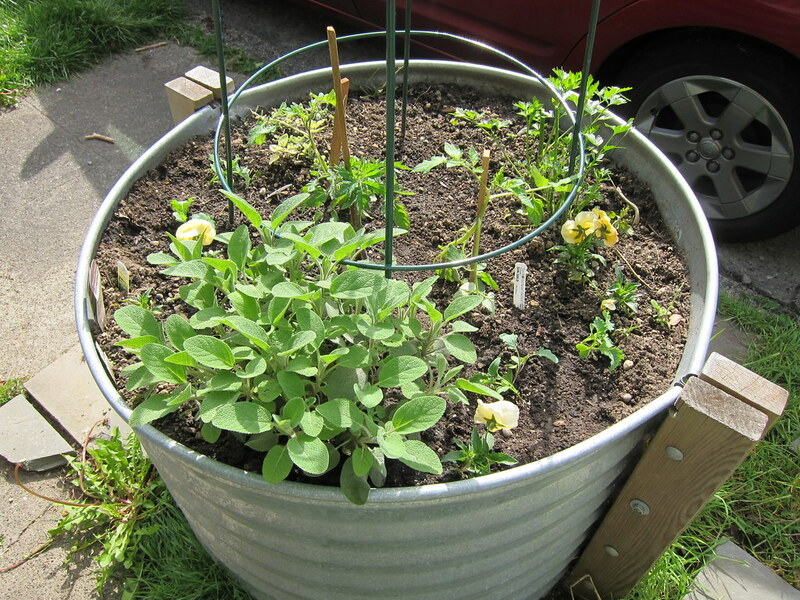 The kids help plant, grow, and learn about where their food comes from. And then they get to eat it! Sounds pretty wonderful to me. 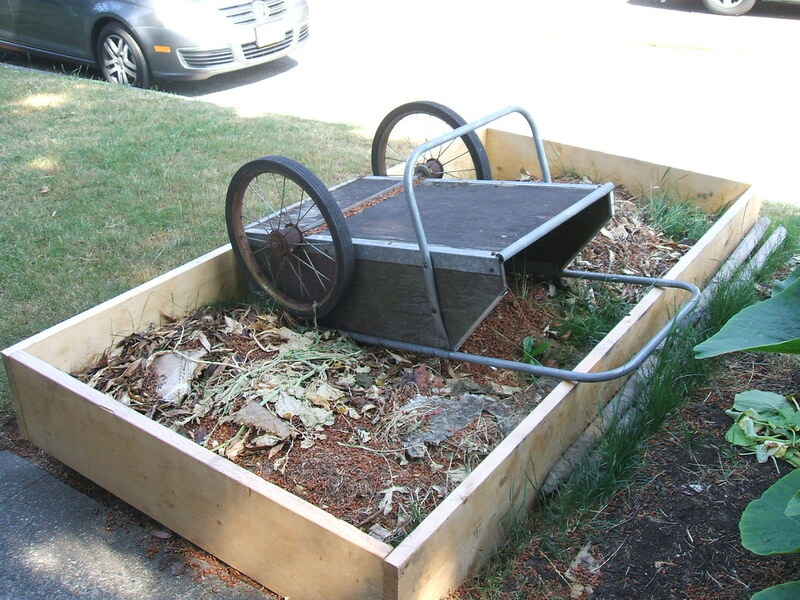 A couple of weeks ago, I took a stroll to the public library to return some overdue books and on the way I saw a raised bed in the parking strip I hadn’t notice before. 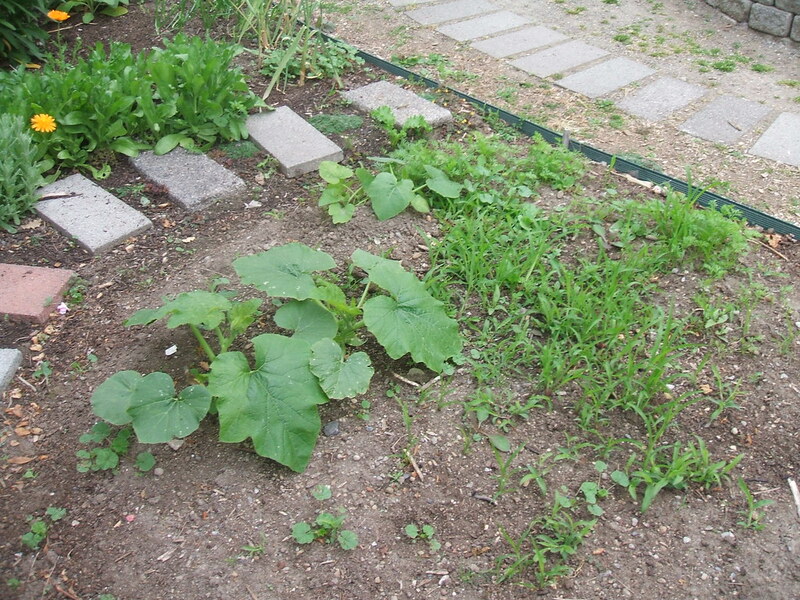 It was a biggie, most of the width of the property, and pretty much a monoculture. As of a few months ago, I might not have recognized this crop, thinking it looked a bit like tomatoes but not quite (they are both members of the nightshade family, along with tobacco, peppers and eggplant). 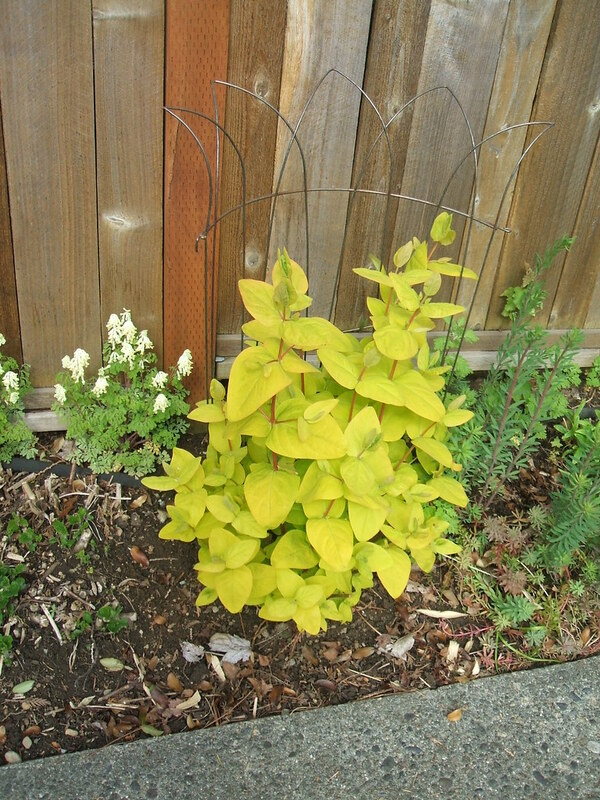 Now that I am a potato farmer myself, on a much smaller scale, I realized right away that this gardener is gunning for a really big crop o’ spuds. They were all planted in nice neat rows and hilled up (the new potatoes form between the original seed potato and the top of the hill). 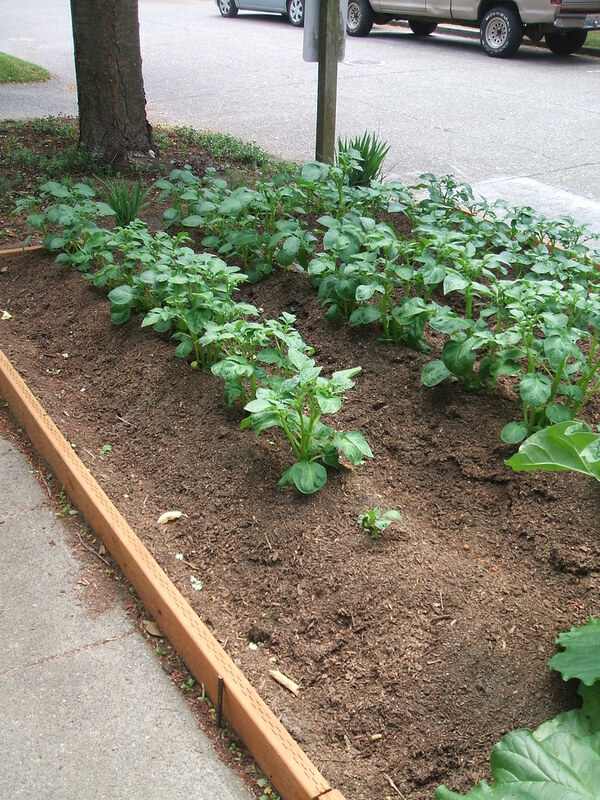 Potatoes do take up a bit of room, so I can see why the streetside planter box was tempting to build. 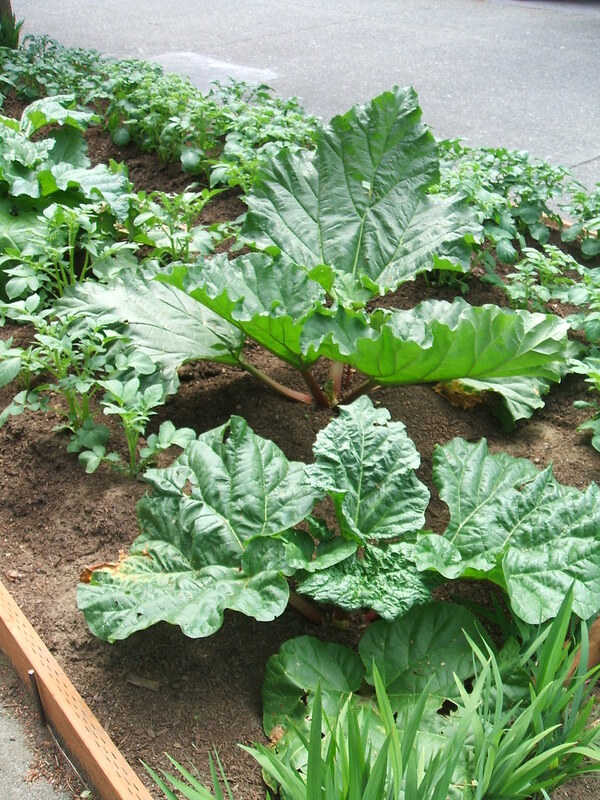 OK, it wasn’t quite a monoculture – there were some really massive rhubarb plants at the end of the rows. I’d seen rhubarb on the street before but not potatoes. 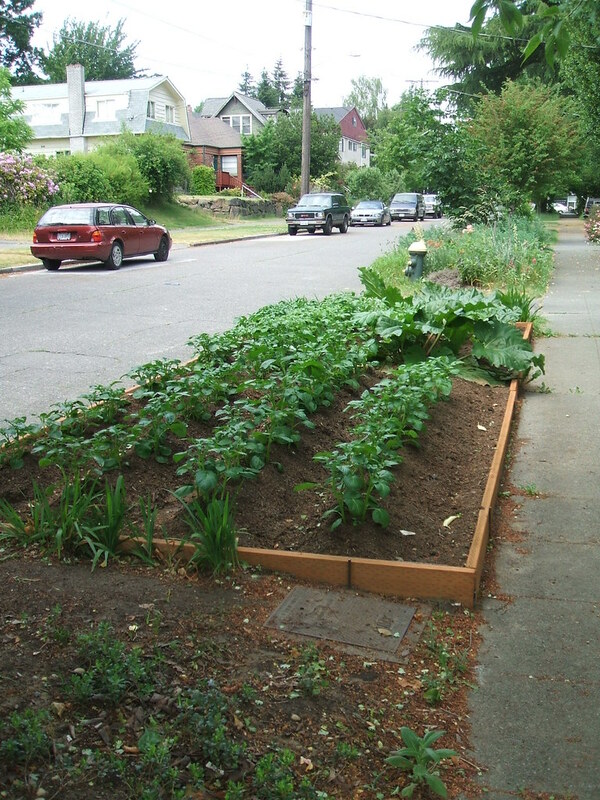 Urban farming is really catching on in Seattle, as is parking strip gardening. I love it when I see people combining the two! I saw this while driving home from the school run last week. I had to stop and take photos, the sight warmed my heart so much. 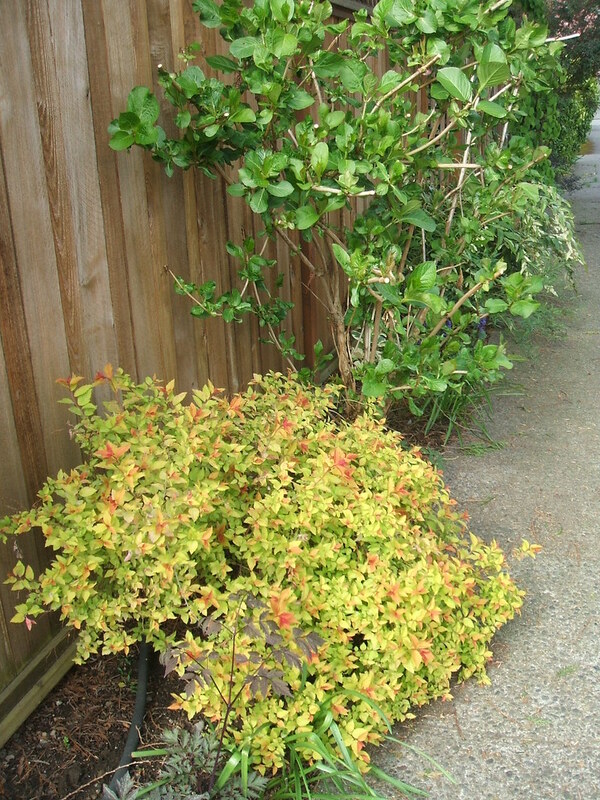 This is a corner lot on a fairly busy thoroughfare, but the beds are located on the side street. Five of them! 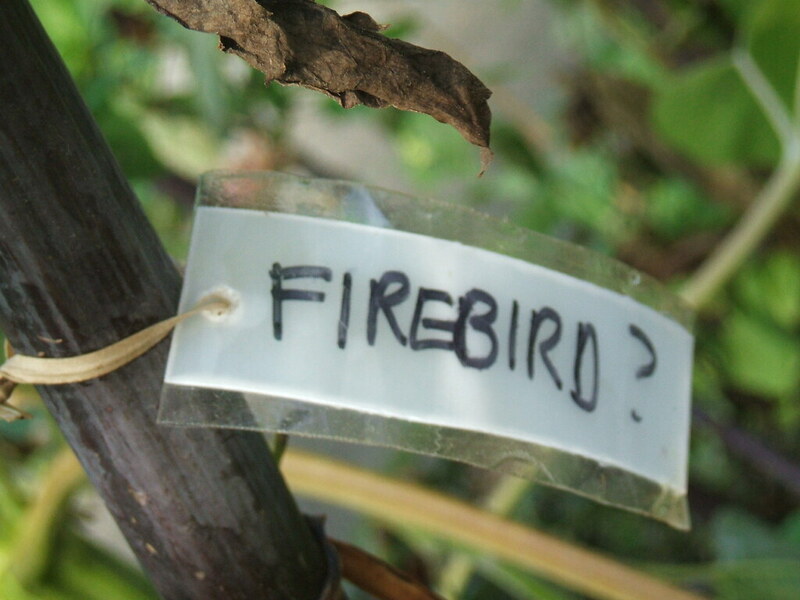 No idea what’s going in but I’m going to be keeping a close eye on them to see how they are planted. Looks like the sod was maybe smothered with cardboard and then stripped and turned over in the spring. Then, in with the black gold! The guy who made them was in his garage, headphones on and table saw blazing. 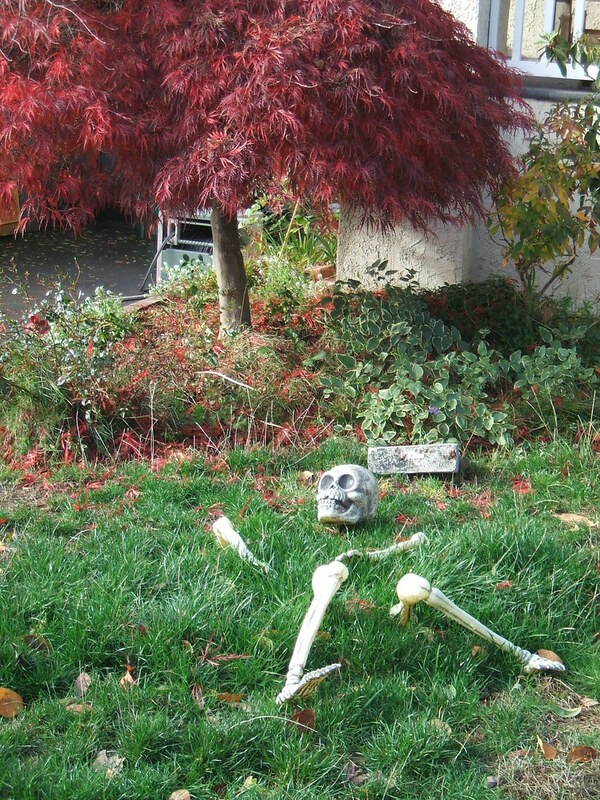 I didn’t have the nerve or heart to hover and stop him to ask about the raised beds, but it looks like either he or someone else there is already an avid structure-builder and gardener, judging from the house-side street garden. 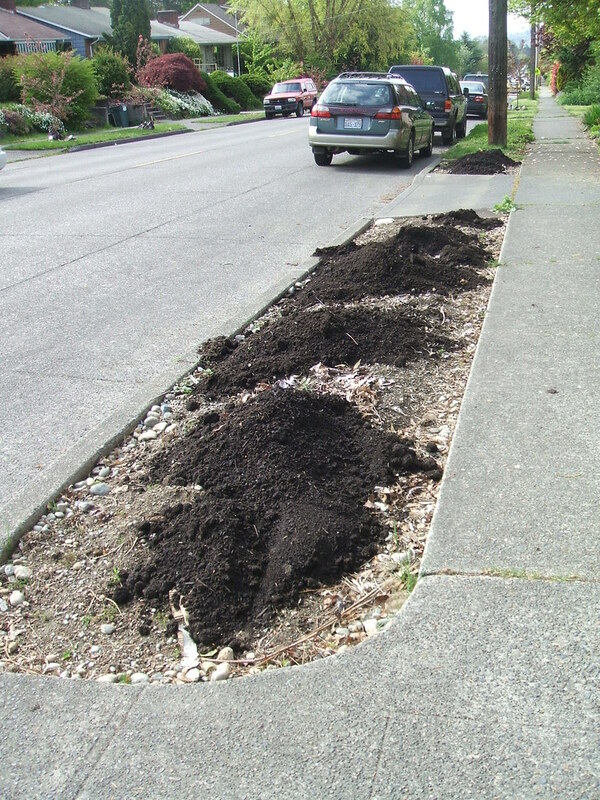 A little leftover good soil, dumped into the arterial side of the parking strip. Guess maybe something’s going in there too! 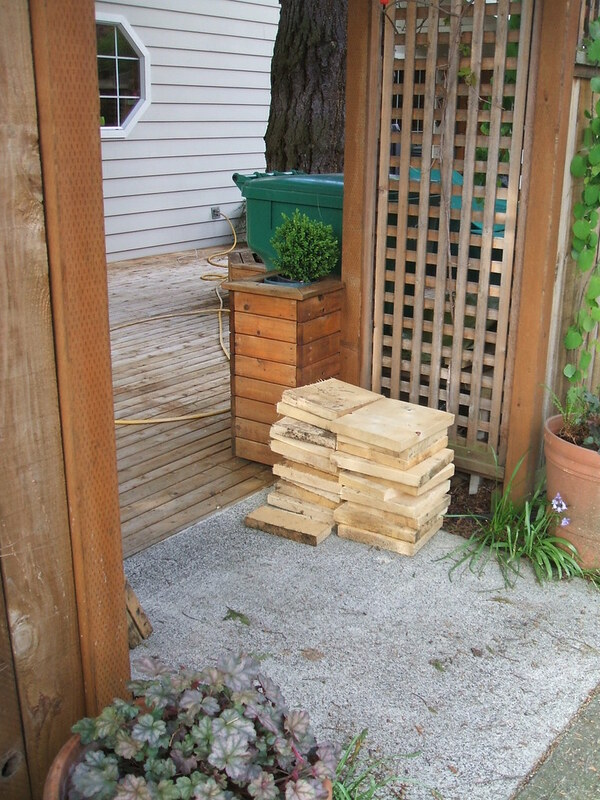 Extra wood, board ends or fodder for the next garden building project? I know, I’m a freak, but stuff like this just sends me over the moon. 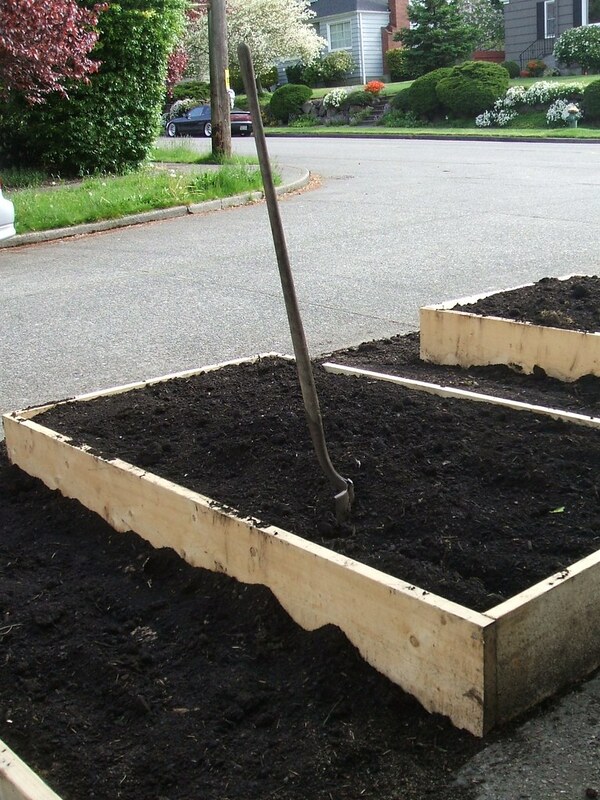 There are so many folks in my neighborhood adding raised beds, ripping up sod, and otherwise making more space for gardens right now. It’s a revolution!